I have long been fascinated by the concept of manifesting what you want in your life through conscious intent. You know: You convey your heart’s desire to the Universe by visualizing it in great detail, and the Universe listens and responds by creating connections and presenting opportunities to help you achieve it. I recently experienced the magic of this phenomenon firsthand. After making the decision in April 2013 to work toward a full-time RV lifestyle, Dave and I debated the type of camper that would suit us best. 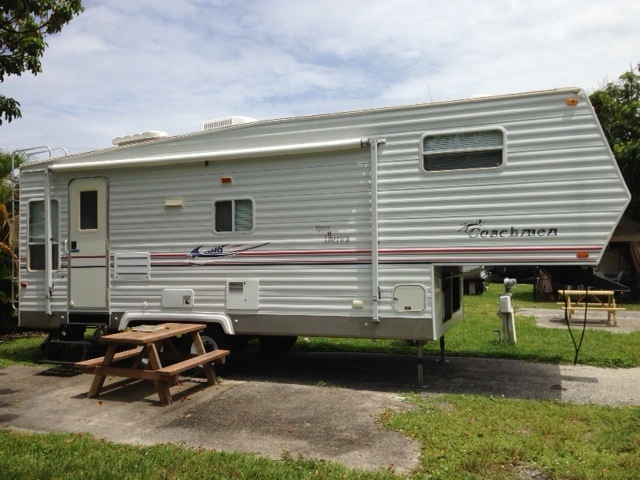 Ultimately we settled on a fifth-wheel trailer. In early July we began to research makes and models, fully expecting the process to take many months. We were in no rush. Having just blown most of our discretionary savings on a tour of Germany to celebrate a milestone birthday, we had little appetite for making a major purchase in the short run. The Universe, as it turns out, had a different idea. To get a feel for features and prices, I started to follow a number of used fifth wheels being auctioned on eBay. Over the course of a few days, I watched each one get bid up to $8,000, $12,000, $15,000 and higher before the auctions closed. All, except one. She was a 2005 Coachmen “Spirit of America,” 27 feet long. The bids had stalled at around $4,000, and hadn’t budged for days. She looked pristine in the photos. And she was less than 15 miles from home. The night before the auction was scheduled to end, I mentioned this odd set of circumstances to my husband. 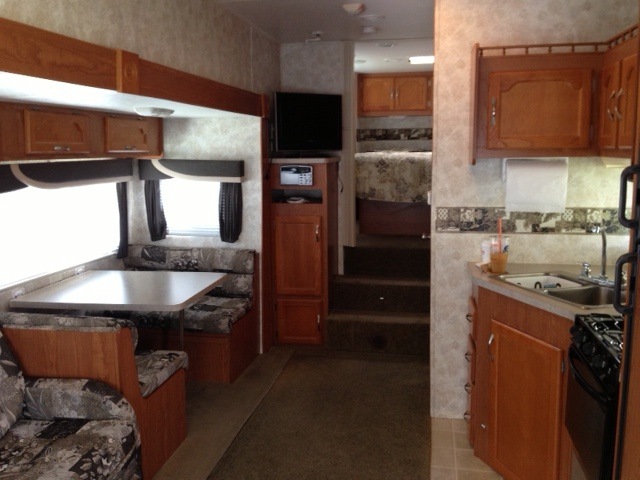 He suggested we send an email to the seller asking to see it in the morning, if only to get a feel for the space and features a 27-footer would offer. The seller agreed. View of rear lounge area. Entry door is to the left, beyond the refrigerator. We arrived for our tour at 9 a.m., four hours before the auction’s end. The seller spent a good 30 minutes proudly showing us every inch of the camper, pointing out a number of improvements he had made in recent months. In a word, it was PERFECT. Perfect size. Perfect condition. And at a third of its value, perfectly priced, too. As we drove away, we felt overwhelmed. We had been window shopping for less than two weeks. Our savings had been depleted by the vacation we had taken just weeks before. We were nowhere close to being ready to buy! 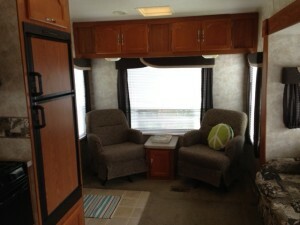 And yet, here was the ideal starter camper, at a bargain-basement price. In our very backyard. Looking in from the entry door. 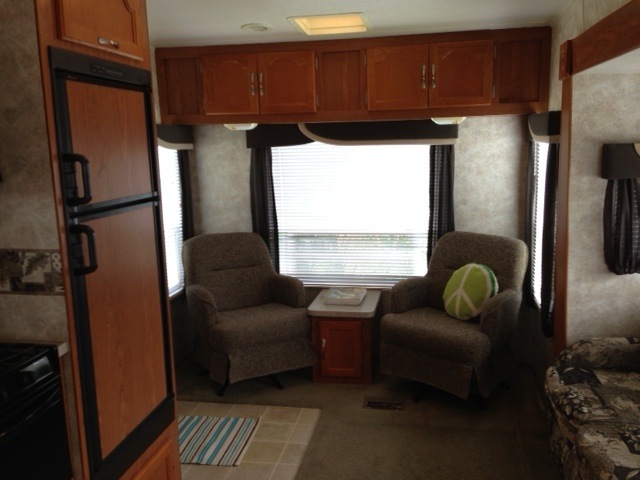 Bertha has one slide-out, which holds both the couch and the dinette. We asked ourselves, “At what price is this camper simply too good a deal to pass up, regardless of our situation?” We agreed on a max of $5,000, still less than half its value. If that turned out to be enough to win it, then it was meant to be. If not, that would be okay, too. We spent the next two hours at the beach, biding our time. At half past noon, we headed to a nearby restaurant, ordered lunch and set up our bid. At 12:55, with just five minutes to go, my husband submitted the bid and we held our breaths as the auto-bidding kicked in. It’s ours… it’s not… it’s ours… it’s not… it’s ours… OHMYGOD IT’S OURS! Five minutes and $4,300 later, we were the proud owners of a gently-used fifth wheel. We named her Bertha. Bertha’s kitchen is across from the couch. I love the window, which looks out at the picnic table/patio area at most campsites. That is one smart Universe. Have you ever manifested something simply by asking the Universe for it? What was it? Were you surprised that it worked? I’d love to hear! That’s awesome the way things worked out for you. We are hoping and praying that our house sells fast so we can work quickly toward getting our RV. We have had a couple of people show interest and we’ve only put out the for sale sign one week ago! Thanks, Bobby! I’ve been listening to your podcasts, by the way. Good luck with the house and finding the right RV! I came upon your site from RV-Dreams. We will be at the spring rally too, but in one of the small cabins. We won’t have our 5th wheel until May. I enjoyed reading through your site. I will be 52 this year, my husband 55. I am in the process of selling my business and my husband will continue to work from the road for a few more years. Congrats on Bertha! I sure look forward to see what mods you make. I always wondered why more people didn’t paint/decorate/etc to more personalize their rigs. I mean, we all change/decorate our homes don’t we? Please post some pics when you do your upgrades! Looking forward to seeing you at the rally! Looking for creative ways to decorate your RV or remodel your camper? You're in the right place. 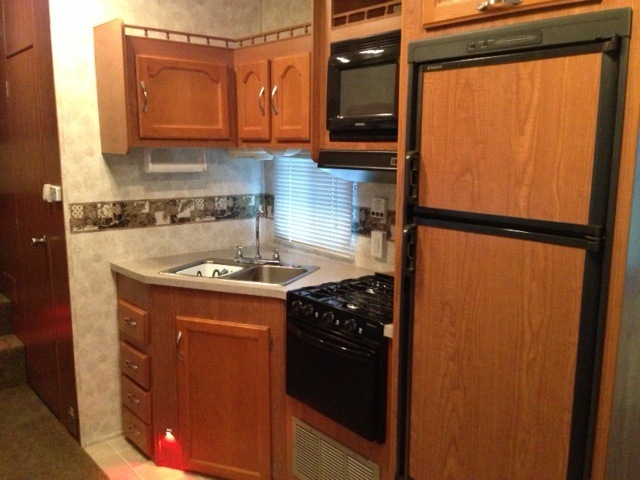 Here you'll find photos, personal stories, practical advice and fun products to help make your RV, camper or motor home uniquely yours. Along the way I'll share my own journey as my husband and I purchase and renovate a camper, and eventually hit the road full-time. Enjoy! The Future Is Here, Dammit!